as i waited for my turn to descend a 20-foot rockfall on the slopes of mount mingan on saturday, i suddenly broke into song. i accepted requests from people in front, while those behind sang along. up ahead, i would hear chunks of rock ranging in size from grapes to footballs, falling off their perches, rolling with musical urgency into a fresh pool of rubble. two hours after that rappel, i had suddenly lost my singing voice. there was a deadening emptiness of human sounds on the trail, except punctuations of pain and caution. the forest was filled with the endless wailing of cicadas, and the sounds of water dripping from trees that blotted out the sun. i could still speak, of course, but i was in a foul, sour mood that did not inspire song. 3 hours previous, i cheerily accepted the challenge to sing in an attempt to lift the spirits of my hiking companions – if my voice could at all be considered uplifting – and to underline that although we fell on our backsides often, there were so many things to be happy about. i had already expected to be at the campsite by then, and yet, there we were, without anyone able to tell us how far away we were from our quarry, like dead walkers in a jungle that had been raked senseless by several careless pairs of feet. that morning started without incident. i nearly missed the bus ride as i had mistakenly assumed the assembly was an hour later. i had difficulty sleeping on the bus as i was anxious about many things, including the thought of getting caught in traffic along the NLEx due to the centennial of the iglesia ni cristo. i would open my eyes and peer out into the vast darkness outside the bus and try to figure out where we were based on the signs along the highway. at around 5, we turned into the gabaldon campus of the nueva ecija university of science and technology, on our way to the ecopark where the trek would begin. the bus had an unusually high clearance because we worried about scraping branches of trees. the bus behind us even caused a power interruption when its roof tripped some wires. 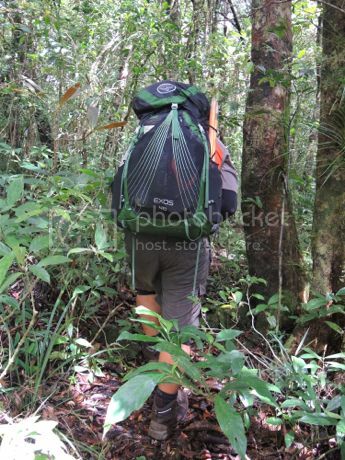 the ecopark sits on the foot of mount mingan, and the trail began inauspiciously after i led the prayer. 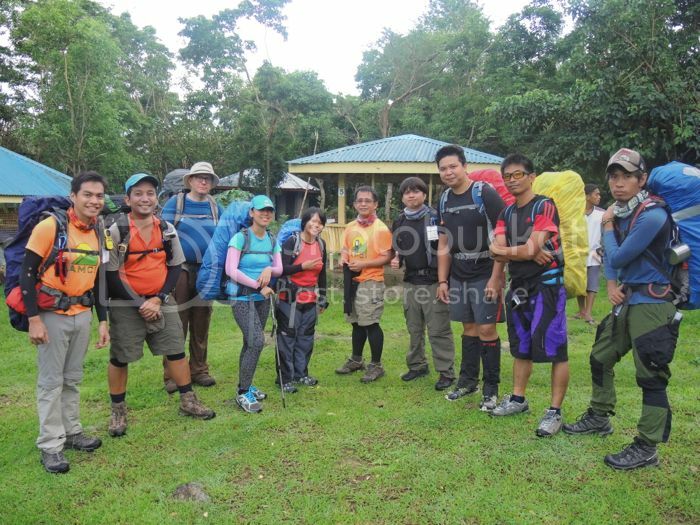 it would be the first time that the club would take its training climb to this mountain, as previous second training climbs had always been either in mariveles or malipunyo. they sought to break apart this duopoly last year when they took the trainees through a different trail up mount cristobal, and this time to an entirely new destination: a place still vastly unknown to urban mountaineers who are less likely to venture into places that are untried, untested. 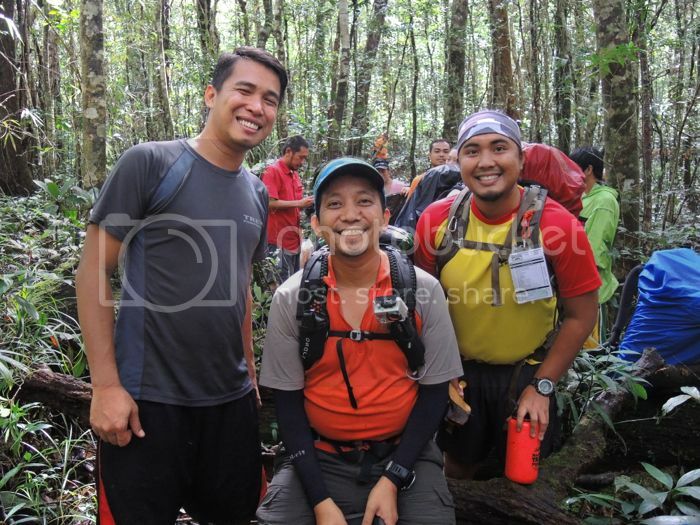 with the exception of the reconnaissance climb a few weekends ago, the only other ascents to the mountain were by foresters and scientists from the DENR and haribon foundation conducting biodiversity surveys. mingan is supposedly important because of the amount of animal and plant life in its upper reaches. the recon team even boasted about spotting very rare eagles. it turned out to be much more common raptors such as the brahminy kite. the trail begins with a series of stream crossings. 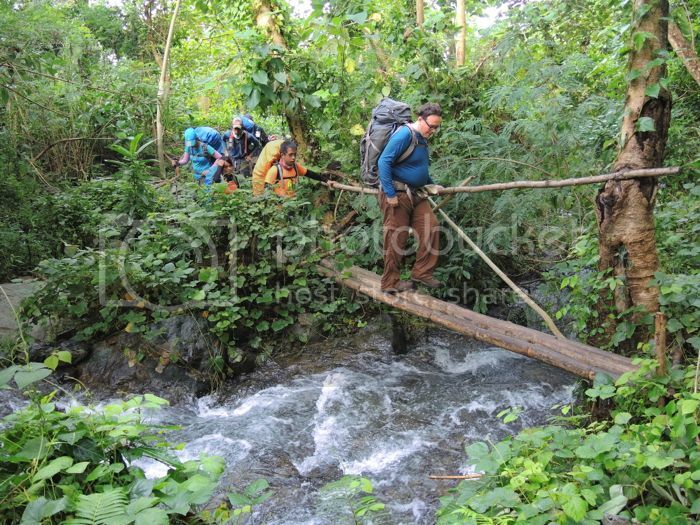 despite rain on most days prior to our trek, the stream was shallow enough to cross with no need for ropes. after the last crossing, the trail suddenly rises, slithering up the mountain along a ridge with steep drops on both sides. the trail is fairly worn, as locals climb its slopes to farm, hunt, and plant boundary markers. the town of dingalan, in the province of aurora is just over one of the peaks. the entire morning was spent along a winding, upwards trail, which in parts was very steep. frequently i had to hold on to anything that allowed me to pull myself up: roots, rocks, branches, trees. after the second trail marker, we found out that we were well ahead of the itinerary, and the bloat seemed to increase the further up we went. there were precious few areas where rest was possible without taking up most of the trail. after the python tree marker, i alerted my companions to the onset of a pair of very painful cramps, but i said i would fight it for as long as i could. i begged for salt from anyone even as i stretched my hamstrings and walked when i could. 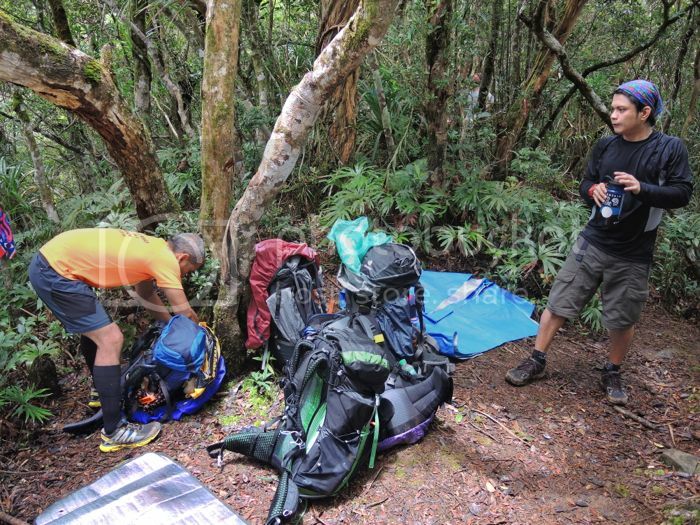 we had a short lunch stop just before reaching the e-camp, where we were initially supposed to make camp, but the recon team found that what the guides described as an area that is able to accommodate 100 people was good enough for maybe just 6 tents. it was actually just a long ridge, at just 1300 masl, and it was there where i caved in to the convulsions on my hamstrings. my already unpretty face was locked in a grimace worn only be people who are truly in some unimaginable pain. before getting there, i sat on the trail frequently and asked help to stretch my legs, although i spoke little about how my hamstring muscles throbbed violently as if they were about to jump out of my shorts. cramping had always been an ongoing concern of mine always on the first day of a long climb, particularly when my load is heavy and the trail is steep. perhaps my absence from the two previous 2nd TCs has come back to bite me. i was not present in 2012 when i flew to myanmar and last year when i had my solo trip to seoul. i would have stayed longer on the ridge, but rain suddenly fell, and it was terribly cold. 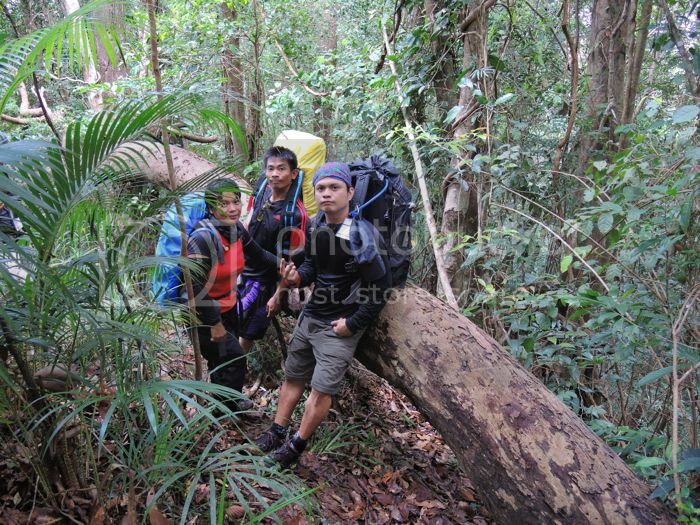 despite not having recovered, i picked up the trainees trekking with me, and we followed our TL to the campsite. he said it would be around 3 hours, as the IT predicted. judging by the inflated time between the landmarks before reaching the e-camp, i expected to be there in an hour and a half. it was just after 1PM and we managed our stops wisely. 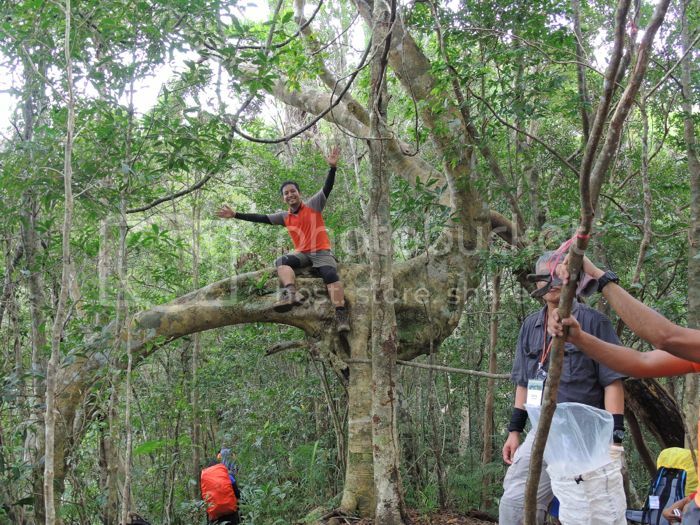 besides, we relied on the guide's assertion that it would just be a short run down the mountain. one of my trainees briefly looked at the IT card and asked why there was an absence of markers between the campsite and the e-camp and my reply was the same as the one the recon team gave me: the gap is there because this part of the trek had not been climbed by anyone from AMCI. i should have known then that this reply should have shaped my expectations for the next 5 hours. as birdsong competed with the siren of winged insects, we dragged our shoes and boots through a trail that can only be described as barely there. in contrast to the path that took us to the long ridge, this trail seemed to have taken shape by mere chance. at times it would rise through thickets of plants with thorny branches, or plow through a mush of mud and rotting leaves. on occasion we would dangle from roots and branches while the ground beneath us disappeared. several times we would wonder how it was possible to cross a section just 10 feet across, when falling 30 feet down seemed a lot easier. we were deep inside the forests of mingan, and during the breaks between the frequent rainshowers, very little sunlight would fall to the ground. at 4PM, i had already reported our elevation in excess of 20 times, and it seemed we hadn't descended much after having spent so long a time on the trail. i told everyone not to rely on the elevation indicated in the IT, nor to the time it predicted to get there, because we were blindly walking, following the bootprints of those who have gone ahead, wondering how long they've been on the campsite, or whether like us they were still struggling to find it. i had by then also lost radio contact with my GL prince. i was eager to report to him our location, but our inability to tell where we were on the trail and how far away we were from our destination had eaten up on my reserves that i didn't just stop singing, i had also started to entertain thoughts of murder. at one point while waiting for our turn to cross a difficult section and a trainee of mine checked on the IT, i told him that what he held was a mere scrap of paper that served no purpose, and that later we would gather all our laminated itineraries for a bonfire and place the climb staff in the middle. the purpose of the itinerary is to establish a baseline that would guide your expectations. it will tell you how much higher you have to go, how much more time you have to spend on the trail. regardless whether it's bloated or just right, an IT serves a purpose other than to add the weight of a feather to your bag, or to act us a fan when it's very hot. having run out of the patience that i usually carry in spades, i began myself asking the questions i used to answer. i raised the doubts and fears i myself placated. only a few hours earlier i was telling people that TC2 is usually the time that trainees realize that mountaineering isn't for them and members ask why they keep joining. 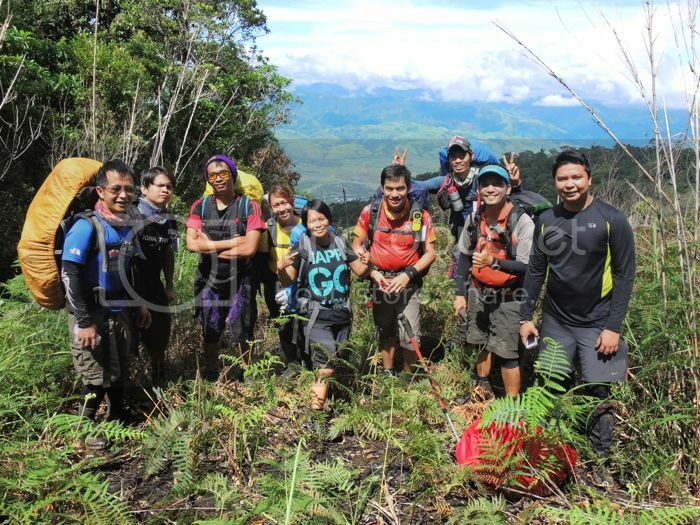 that afternoon on the mountain, i concluded that i didn't miss TC2 although my last one was in malipunyo in 2011. it got so bad that i had gone as far as challenging the wisdom behind choosing this mountain as a venue for the training. there clearly was a failure in managing expectations in this climb, and it was due largely to the failure of the recon team, despite their many visits to the area, to find a campsite suitable for the usual size of the training climbs, but more importantly, on their reliance on what turns out to be highly inaccurate and possibly false feedback from the guides. 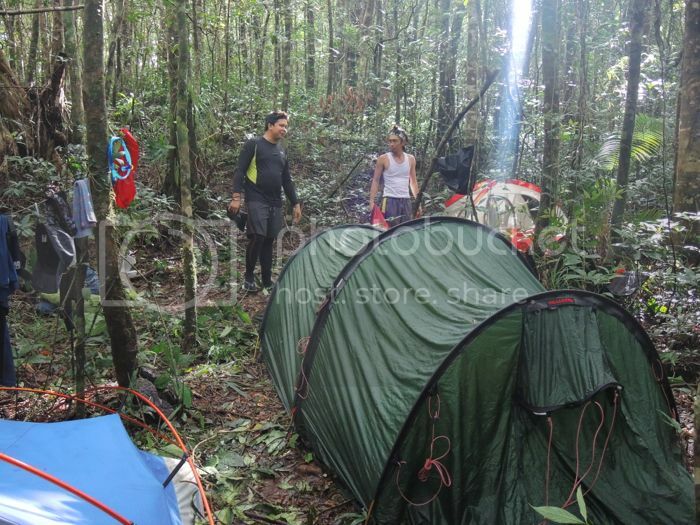 that they decided to push through on the strength of the guide's assurances that the trek would be possible and that the campsite would be large enough to accommodate a group our size is not just far from ideal, but is a recipe for failure. i never approve of mixing reconnaissance missions with training climbs because we are initiating people to the sport, hoping they take it up as a serious hobby, rather than regret their decision of joining the BMC. this certainly is not the right time to subject people to climb experiments, because it amounts to trifling with their safety, and ultimately, their lives, and the lives of people that are linked to theirs. i felt, in all honesty, that during that small window when my usually reasonable self evacuated after suffering brief moments of desperation, that we strayed too far away from the club's core commitments. i was still seething as i crawled under the root of a slender tree whose trunk bloomed into a skirt resembling the tentacles of an octopus. only 20 more steps away was the campsite. but it hardly resembled one. patches had been cleared between huge trees to make way for tarps and tents. 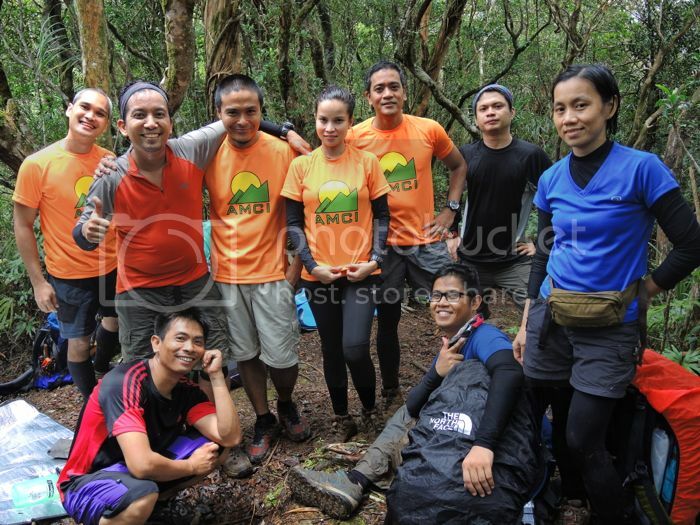 half of the team was still behind me and it seemed there was nowhere else for us to set-up camp. all around were spaces allocated for people still not there, people who will probably spend their evening on the trail. unfortunately, i wasn't fast enough to make reservations for my group, as i felt it was more important to trek with them than to just announce they have places to pitch their tents once they arrive. our guide helped us clear an area too small for our 5 tents, but i couldn't complain about the cramped conditions as everyone suffered under similar circumstances. i calmed down a little and finally stood up in order to help set up a kitchen. i was eager to make soup for everyone. by the time the water for the soup was boiling, i began to worry about the several instances when fear filled my heart and vines of thorns coiled around my throat. i was concerned about those who had to cross those obstacles in perfect darkness. i had already turned on my headlamp and was eager to change into camp clothes but couldn't since we had none of our tents. i borrowed someone's malong and was suddenly fresh and clean. i sat under our kitchen tarp and gave out hot and spicy soup with rabbit cakes, tofu cubes, and squid balls when one of my trainees appeared. he said he hurried so we could cook rice. we almost were unable to since we had no more water. the guides refused to fetch since we all arrived at the campsite late, so we had very little to go around. my disappointment at the piling miscalculations were such that i was in no mood to hop to other kitchens. besides, we were so spread out that i would have to travel some distance to see everyone. thankfully, three more of us arrived after 8PM. when they appeared bowing under our improvised clotheslines, the earth they walked on had wrapped their legs, coiled around their arms, clung to their bodies, and kissed their faces. despite all these we still managed to cook a simple but excellent dinner. i haven't had pork sinigang on the mountains for a while now because i insist on going gourmet all the time, but it was suited for the cold as well as the conditions of the campsite. there is nothing more comforting than familiar filipino food. i took out two boxes of squished but still edible happy cream puffs. afterwards we opened my bottle of absolut vodka chased with calamansi juice and although i accepted my fate that i would be spending the evening under the kitchen tarp, it seemed everything was alright in our small world. i could no longer receive updates from prince, or anyone else who had been left behind, but i knew, as was my prayer the previous day, that we had both training and experience to rely on in order to survive the worst conditions in the mountains, grave miscalculations including. i inflated my thermarest and found a spot on the kitchen with the least bumps and slept soundly even as the rain drummed on the tarp covering me. many friends were still on the trail, so i was thankful i was dry and could manage to even lie down on something that afforded me some guilt-ridden comfort. the following morning, i was awoken by sounds from another group and it was good that i didn't have to say a word for my trainees to rise from their earthpads in order to see to the kitchen. while preparing breakfast, prince showed up, a little sleepy, but clean and dry. i gave him a hug and greeted him a happy birthday. he said he arrived at the campsite at half past 1 and pitched his tent in the first available spot. the entire group was happy to see him as most of us last had the privilege of his company prior to lunch. by 8AM we had all eaten and were already starting to pack. i hadn't been informed what time we would leave, but it was only after the last of the sweepers arrived. from our spot at the farthest end of the campsite we heard applause, and we could only assume that the sweepers and their clients were finally arriving. suddenly, a queue of people with packs on their backs started arriving and we were caught unprepared, although we were just like them ready to trek. many of them went ahead and we worried about the conditions of the trail once it was our turn. it was described as 2 hours of forest and 4 hours of pure mud. i disregarded the description and just prepared to be on the trail until well after lunch. although we were perched at 1030 masl, the end of trek was above 200. the TL said we’d end up in a local cemetery and i wondered whether we’d go straight into our burial sites. the trail descends gently through the forest where conditions seem to have tamed compared to the previous day’s torture. it was more established and there were several trails branching out to other places on the mountain. at times the path was so wide, we could have walked 5 persons abreast. 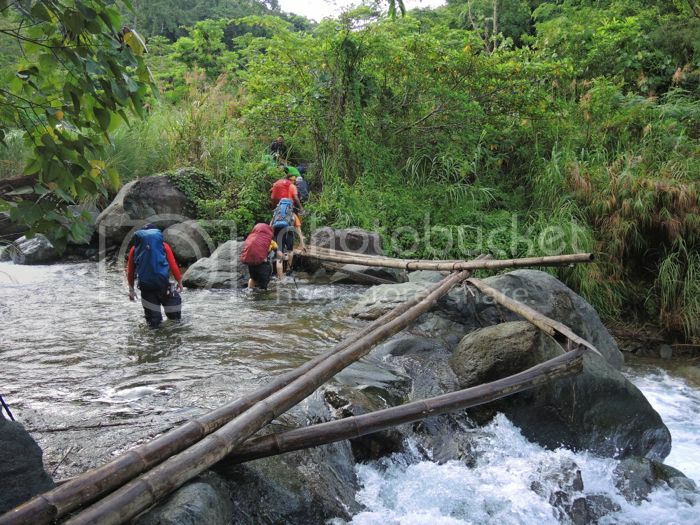 there were few challenges save for mudslides created by locals pulling or pushing cut logs. along the trail we would find pockets of views which we were deprived of since after we left the stream the day previous. i would often find alternative routes to the ones taken by others in front of me. eventually, the forest thinned and we stepped out onto sloping fields of windswept grass. there were also portions where it was so steep, some trainees were descending by sliding down on their backsides. by this time, the sun was shining at its brightest and my energy reserves were quickly drying up. i would frequently pause under the shade of trees even though i wasn’t tired. i only worried about painful toes and subungual hematomas. i just kept walking even though it felt as if the sun had placed a crown of burning charcoal on my head. before i realized it the trail had flattened and we were in a vast open field just outside the local cemetery. i was so filled with joy i ran past everyone ahead of me and immediately liberated my feet from my oppressive boots. i congratulated everyone i shared the shade with and waited patiently for the jeepney to ferry us to the ecopark. it was just a shade before 1PM. we were deposited at the park where cold beers were on sale and a buffet lunch waited. we were spoiled for our choice of clean-up: the stream was just beside our cottages, while a kiddie pool was also inviting. it was a long and sometimes anxious wait for the arrival of the last person. 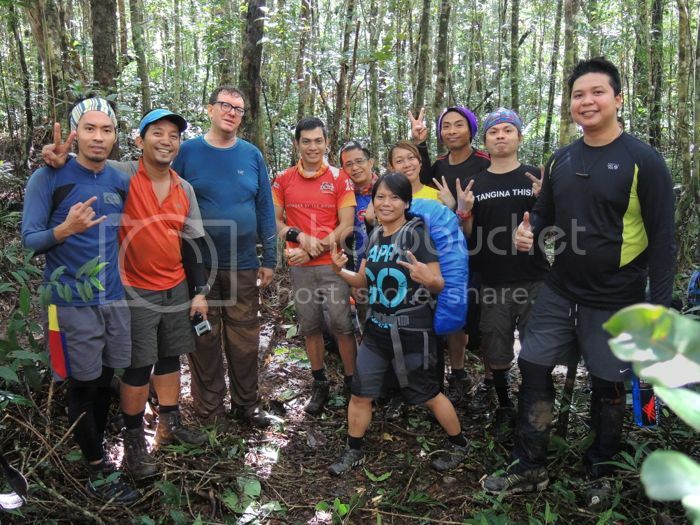 although we saw all of them before we started to trek that morning, we were uncertain about their well-being and if they could still hold on to the last strands of sanity despite what transpired. like some previous second training climbs, this experience could push you to the brink of surrender. but such is the character of an AMCI TC2. it is not supposed to be enjoyable because it is easy, but it secretly asks whether you’ve enjoyed it despite the misery. i still think that the recon team should have done so much more to prepare the participants and manage their expectations. i am not saying that the trek from the long ridge to the campsite should have been shorter. i am saying that the actual time should have been apparent and realistic. i am not saying that there should not have been these dangerous portions, but that we should have at least been informed that there would be. i do not disapprove of this mountain as a destination for training climbs, but that the mountain should have been plotted in the tradition of all good training climbs. truth be told, if it had not been for those 5 hours between the two emergency campsites, the climb would have been unmemorable. no one would be talking about it immediately after the next training climb. i was asked by a trainee how this climb stacks against all the previous TC2’s i’ve joined. i paused before i could give an answer, because i wasn’t sure whether he was asking me if it achieved its purpose or if it was more difficult than anything that had taken place before. alas, the climb’s failure or success will be measured not in terms of how many did not reach the campsite, nor by how many scars and bruises we will all show off when we’ve returned to the plains. the climb’s true value, regardless of what we may personally think about those who plotted it, will be appreciated in the medium term and well into the future. it isn’t at all ironic that we should feel more triumphant after finishing a climb that at times felt as if it wanted to finish us. 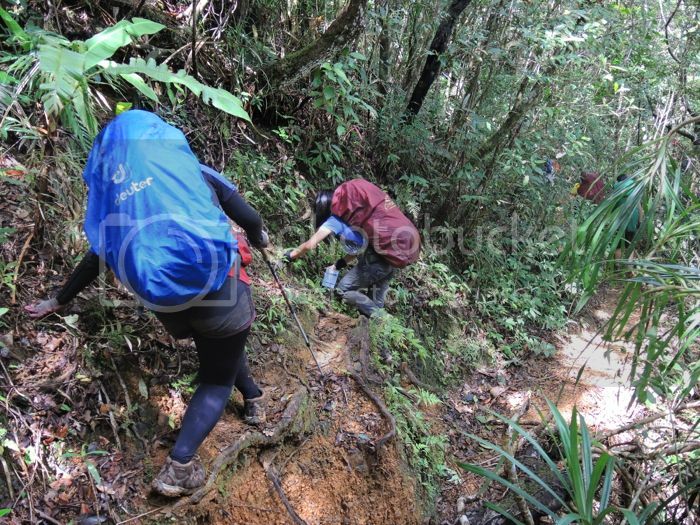 it should not be surprising that we should all feel proud, when during the trek we felt nothing but embarrassment over falling again and again. if in the next climbs we become people who ask silly, existential questions to ourselves and be able to provide clear and convincing answers, then this climb would have served its purpose: to push us really close to our limits, until we push back with the strength we didn’t think we had.